Travel is one of the most exciting and enjoyable hobbies, taking us out of our everyday lives into new realms. Sharing the world with your loved ones and watching them experience a new destination is amazing. However, the number of options for a trip can be overwhelming. Have you tried an online search for Mexico Beach Vacation? You’ll have thousands of options, so how do you whittle those down to the one that best fits you? The problem was, the resort they asked about is on a rocky cove with a small, manmade beach. When I shared that with them, we began the conversation to find the right spot. This happens frequently, as online information can often be misleading. Which is why I travel extensively, to see locations first-hand. I also have access to in-depth objective supplier information which delineates all details of accommodations, so I can make a fair comparison rather than relying on biased, and often-times, paid online reviews. Working with vendors also gives me access to the best prices and options. The wholesale suppliers through which I acquire clients’ trips purchase thousands of airline seats, hundreds of hotel nights and therefore have a buying power beyond that of any individual. These lower prices are passed along to my clients, providing them better value. Further, that buying power provides a clout that exceeds what any one agent or firm can have. Let’s face it, sometimes things go wrong. However, when there is an issue, I leverage those relationships on behalf of my clients, interceding to expedite a resolution. Last year, Mike and Donna enjoyed a beach vacation, and as I usually do, I touched base when them on their return to hear their thoughts. Overall the trip was excellent, but he mentioned as an aside that they had to change rooms because of a leak in the first room’s closet. No problem, they said, just an inconvenience. I contacted the supplier and reported the issue with the result that they provided a gift certificate towards the client’s next trip. That’s not a guaranteed outcome, but I never hesitate to go to bat for my clients. 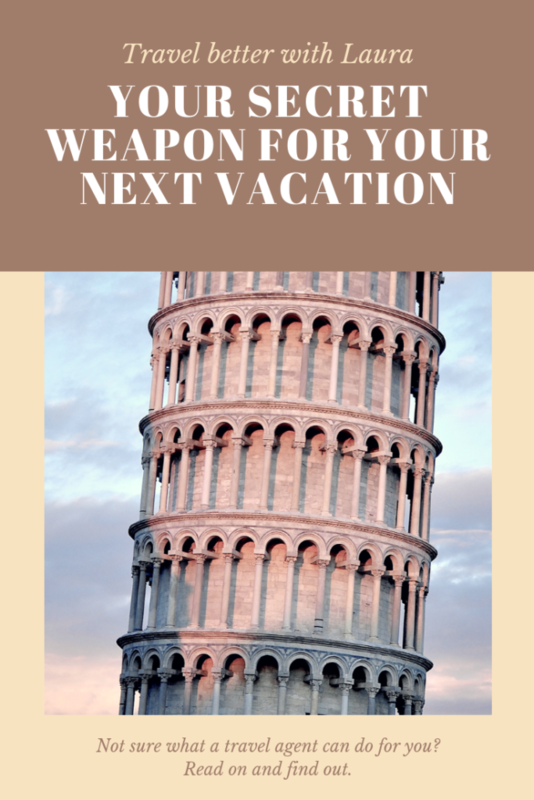 It rarely happens, but sometimes there is a problem during travel that requires immediate resolution. Not only am I available to clients, but I have local representatives at their destination to help. Whether keeping track of payment deadlines, providing all loyalty program details for maximum benefits, verifying all reservations are correct, confirming seat assignments and making excursion reservations, I take care of all the details. Why spend hours doing these things when you can have the peace of mind that I’m covering it? Those details all add up to keeping track of the itinerary to assure that you are not overbooked, and that your time is being used well. Before you travel, I will provide a detailed itinerary with day-to-day details of where and when you are scheduled, with local contacts in case of any issues along the way. You’ll be provided an updated itinerary as we build it, so you can review and be certain the features you want are in place and that you know what is planned. There’s always room for adjustment, up to the point of departure, as we work together to plan the trip that fulfills your desires. My Mom always hopes for a serendipity for me as I travel. Serendipity means “making desirable discoveries by accident”. The same is true for what I hope for my clients: an unexpected opportunity of which they were unaware that will augment the pleasure of their trip. Maybe it’s a meeting with a local artist, or walking tour with a resident; maybe a cooking class or behind-the-scenes view of local life. Let’s talk about what will round out your trip to make it more than you expected, so you come home feeling like you really saw the destination. None of this is by accident; rather, by design of working together, using our travel team as your secret weapon.